What if you could have a healthy breakfast that tasted like peanut butter cups? Good news—you can! You can turn nutritious ingredients like peanut butter, milk, and chia seeds into a tasty, easy to make meal that will keep you full and feeling good all morning! Chia seeds are known as a “superfood” because they are full of fiber, protein, and healthy omega-3 fatty acids. They swell in liquid, making a ‘pudding’ that you can flavor with limitless healthy ingredients to fit your tastes. Of course, no single food can automatically make you healthy, but replacing a fiberless sugary cereal with chia pudding is a step toward healthier habits. You can make a serving or two ahead at night and it will be ready to eat in the morning. The delicious combination of peanut butter and cocoa powder, along with skim milk and chia seeds, is one that is full of fiber, protein, antioxidants, and healthy fat that will keep you full and satisfied for hours while also keeping your blood pressure healthy. In a jar or other container with a lid, whisk together cocoa powder, peanut butter, honey (if using) and milk. Stir in chia seeds. Refrigerate at least 6 hours or overnight. In the morning, top with peanut butter, peanuts and/or mini chocolate chips and enjoy. Use almond butter or sunflower seed butter in place of peanut butter, if desired. The nutrition breakdowns for different nut butters are similar. For vegan, use non-dairy milk of choice, agave, or maple syrup in place of honey, and vegan chocolate chips. 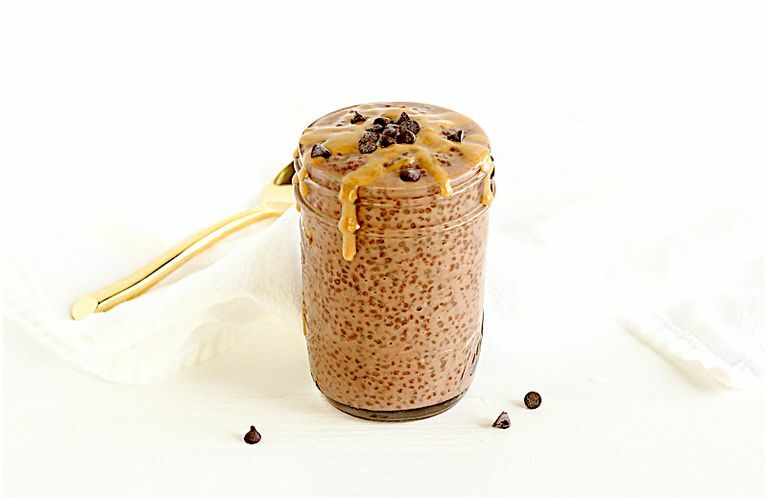 Chia pudding can be served warm or cold. To eat warm, heat in the microwave for 1 minute in a microwave-safe container.